When it comes to professional use, most Pressure Washing Services use a wide array nozzles and attachments to deal with different cleaning issues. We are giving their brief below! 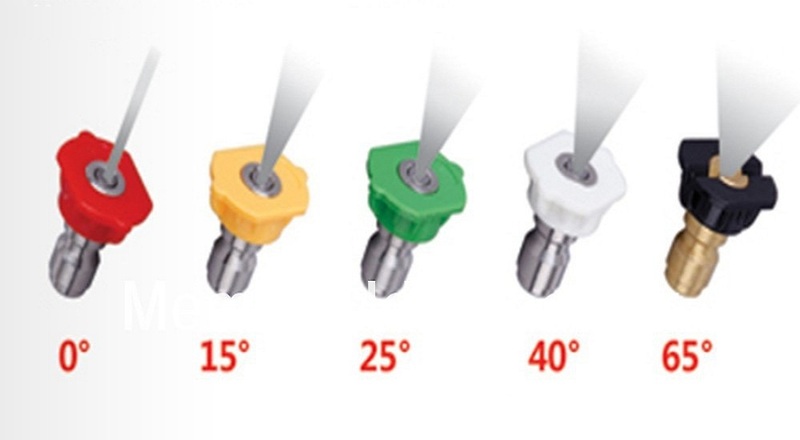 Pressure nozzles are color coded due to their use and angle. We are going to pinpoint their specs, and recommended use, and why a Pressure Washing Service keeps all of them for every trip. Red: Red nozzle has the narrowest angle, zero degrees. It is used to create a water stream which causes immense damage. It shouldn’t be used close to any surface. Black: These make the spray angle of 65 degrees, it is softest and light. It removes dirt, and stain. It is the ideal to use close to any surface. Green: Green Tips have 25 degree. These are idea to wash car or get rid of mildew on furniture or other wooden surface. White: White tips have a 40 degree angle, and cleans exterior. These are ideal for windows as well as siding. Yellow: Yellow Tips have a 15 degree angle. These are ideal to wash concrete. Rotary Nozzle: Aka the Turbo Nozzle, it offers zero-degree water stream. It is used to get rid of hard stains and such buildups. Pressure Washing Broom: These divide a single jet into two or more to cover a larger surface. Detergent Reservoir: It is attached to pressure washer, and adds a cleaning mix into jet water. Surface Cleaner: It uses a spinner bar to spread high pressure water to a larger surface. It cleans large expanses of concrete, etc. Expandable Wand: It allows more reach to clean high surfaces so you won’t need a ladder.